I recently had a surprise in the post, with Ubisoft being ever so kind in sending me a copy of Watch Dogs 2 to play and review for the blog. It's been a while since I've had the pleasure of reviewing a Ubisoft game for any site, with the last one being a Just Dance game if my memory serves me correctly (not counting the AC Syndicate review on this site, as I bought that myself). I was one of those gamers that enjoyed the previous Watch Dogs game, with it not being the best game ever by any means, but it was enjoyable just messing about on it with friends, and the campaign kept me coming back until finishing it off. As with every sequel we always expect the second instalment to be a more polished experience, and early doors this very much seems to be the case with Watch Dogs 2. This is me talking after only a few hours of playing the game mind you, so the question is how will I feel when I'm 20 hours or so into the game? (cue Wayne's World transition to me in the future). 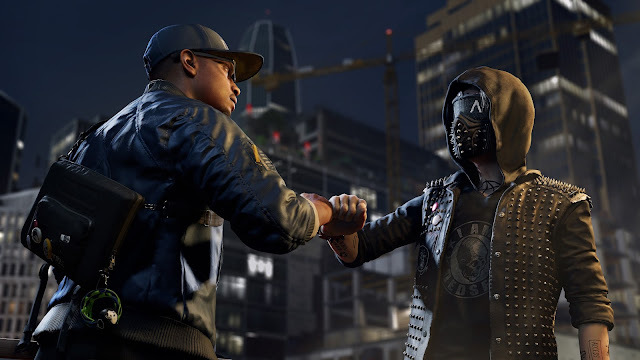 In Watch Dogs 2 you play the game as Marcus Holloway, a cool hacker who is picked up by the hacking group Dedsec (picture cool nerds who like to hug with one arm, and fist bump while working on computers). This right away is an improvement on the first game, with many (not me) moaning about how dull and forgetful original Watch Dogs lead character Aiden Pierce was. While Marcus and this group have a bit more get up and go about them this time around, they can also come across as annoying and cringe-inducing at times too. The difference with Aiden and Marcus doesn't just end at coolness rating either, as Marcus certainly handles a little better than Aiden did, or at least that's how I felt. Jumping off ledges with backflips and spins, he just acts how you would expect the character to be, with a melee attack too that sees a swift smack or choke with his trusty ball on a rope or "Thunder ball" as the Internet seems to be calling it. 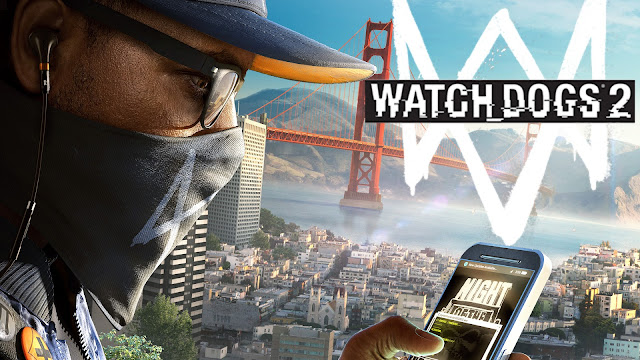 I actually enjoyed the story of the first Watch Dogs, with the chance of getting family members back being something I could connect with a bit more over the story in Watch Dogs 2 if I'm being honest. This one sees you wanting to take down a company called Blume, with CTO, Dusan Nemec being the face that represents this massive company as you play through the game. With hacking missions a plenty, and letting the unknowing public know what dirty swines this company is, while at the same time growing the follow count of your group being what it is in a nutshell. Doing missions will earn you followers and notoriety with the public, while at the same time earning yourself some upgrade points so you can upgrade your hacking device and other areas of Marcus. Away from the alright story, the game also has a bunch of side quests and things to do, not forgetting online being a part of the game too. Side missions add to the story along the way, with most of them feeling like they mean something, rather than the standard throwaway ones we tend to see in other games. We have those too with the likes of drone/sailboat/Ekart/motocross races all over the place, but even these act well as a change of pace from the hacking missions found in the story and side missions. Online events can happen at any time, with people jumping into your game trying to hack you or an event popping up in which you must neutralise someone trying to escape from the cops. While hacking events can at times be an annoying side of the game if you just want to enjoy the game without distractions, they don't happen enough to make it an issue, and even if they do they can easily be switched off in the game options. In terms of other online games available other than the standard hacking, co--op missions and a bounty hunter (escaping from police and other online players) mode are also available. I found jumping into a game with a friend only adds to the fun that can be had in the city, with one cop chase going on forever, but just throwing up moments I wouldn't have been able to experience had I been by myself. Running from cops while driving a truck with a ramp and watching my co-op player flying over my roof to escape our 4-star rating with them just being one such moment that sticks out. With co-op you can try the handful of missions available, or you can ignore them and the story for a bit and just enjoy the world that is out there for you to have fun in. Overall: I've had and am still having fun with the game, with the delay in getting this review up mostly being down to just that. 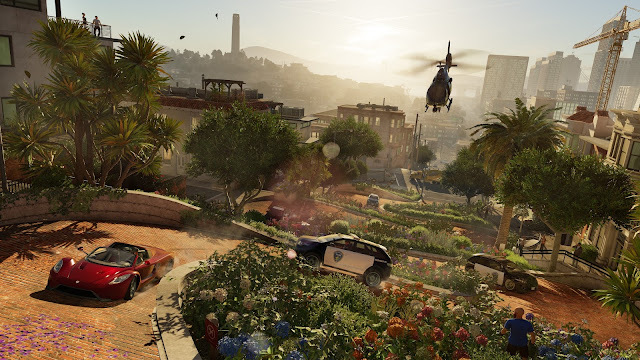 Sometimes I just get to review a game I enjoy, and Watch Dogs 2 falls into that bracket. While not being a million miles away from what the first game offered, this one does it a little better while looking better than ever. If you missed the first game that's no big deal, as this game is great for both new and returning players, with the game offering something for both.